Step2. 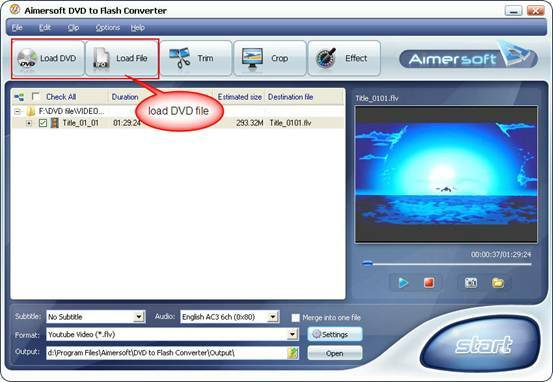 Load DVD file Then install and run Aimersoft DVD to FLASH Converter. Load your DVD into the program: Please click "Load DVD" button or directly click the File -> Load DVD folder in the main interface, then select your DVD-ROM in the pop-up window and press the "OK" button. You also can click Load File button to import IFO file from your computer hard disk. Step3. 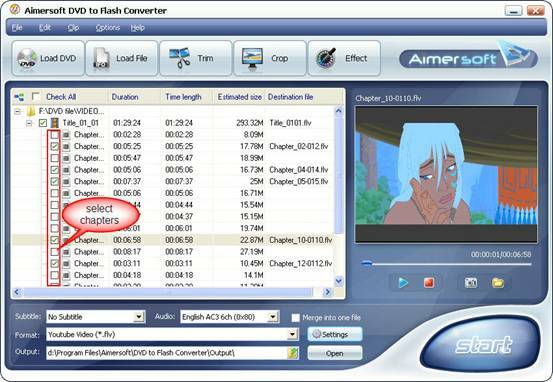 Select the chapters you want to convert. You can convert the whole DVD by highlight the title which contains the whole episodes of DVD, such as title 01 in the following screenshot. Or if you like, you can select certain chapters to convert: Press the little button before Check All on the interface to find all the chapters in the file. This software fully supports all kinds of DVD, such as regular DVD movie and DVD MTV. DVD MTV will have several titles, so you can select the desire MTV to convert. 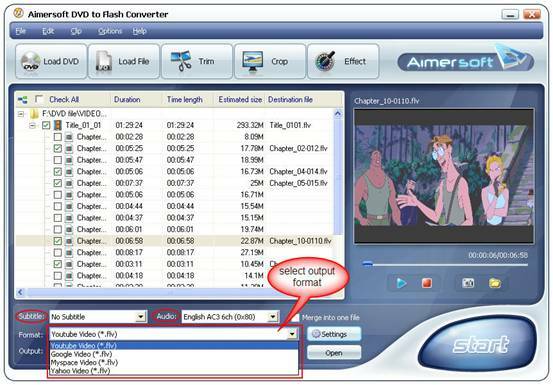 Format: This software can convert DVD to FLV format. If you want to upload regular video files to these websites: Youtube, Myspace, Yahoo! Video and Google video, just select the proper format according to your need. After all things done, click Start to start conversion. I'm a big fan of flash.